Where do I park for the farmers market? 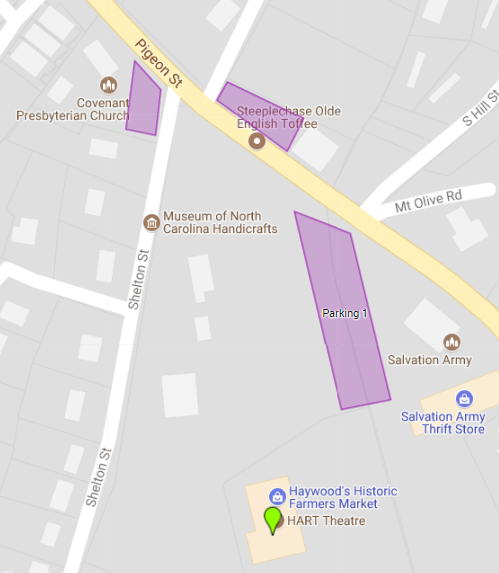 There is a huge parking lot at the HART Theater (250 Pigeon Street, Waynesville), located just a few steps from the farmers market. However, on our busiest of market days, this parking lot can fill up. Luckily, there are two other nearby parking lots that our market shoppers can use. One of these lots is directly across Pigeon Street at Steeplechase Old English Toffee. If this lot is full, there is a third overflow lot across Shelton Street at Covenant Presbyterian Church. All three parking areas are shown in purple on the map below, Parking 1 is the main parking lot at the HART Theater.